Lexus' sporty IS saloon | What Car? Lexus has launched a sporty version of its IS executive saloon, which is intended to look like the muscular IS-F performance car. 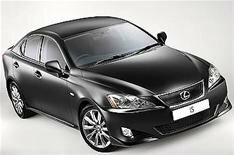 The IS 250 SR is based on the entry-level IS 250 model, but adds a full bodykit, 17-inch alloy wheels, aluminium pedals and heated seats. The extra kit is worth 3500, but the premium over the IS 250 is 1000. Prices start from 24,990. The car is powered by a 204bhp 2.5-litre V6 petrol engine, which powers the car from 0-62mph in 8.1secs, when combined with the manual gearbox, or 8.4secs with the automatic. Standard features include 10 airbags, climate control, cruise control and keyless entry.